Female riders are drastically increasing in numbers every day. Look for them at any trailhead, and you are bound to notice a growing percentage of the riders these days are indeed women. Getting out on the trail and riding full speed ahead is just as exciting for women as it is for the more traditional male rider; however, before you hit the trail wide open, there are a couple of things that you need to take into consideration. First off: Always be prepared! Remember: You must prepare for the accident then enjoy the ride! Don’t be misled. There is a common misconception that ATVs are a lot safer, say for instance, than a dirt bike, just because they have four wheels and can stand up on their own. This assumption sometimes leads to disaster. Sure an ATV can stand on its own. So as long as you are sitting there, looking pretty posing for a picture, you should be just fine! However, going around a curve, up a hill or slamming into something head on, you might want to be aware of a few other facts. For instance, an ATV is typically 2 to 3 times heavier than a dirt bike; and when it lands on top of you, you will know why that is important! Also, this will be important when it gets stuck in the mud or off over an embankment. Always be prepared to lift something 3 or 4 times your own weight out of an unplanned location! The best way to do this is utilize either the buddy system or a winch/tow kit on the ATV itself. This fact also has to be taken into consideration during loading and unloading the ATV. Speaking of the buddy system, that is always a good idea. Never ride alone and always make sure someone knows where you are going to be riding and when you plan to return from your trip. There are other things to remember as well. Always carry a first aid kit, a bottle of water, a whistle and a radio. The first aid kit will come in handy if you or another rider is in any sort of accident, or even scrape your hand trying to change a spark plug! A bottle of water is useful to wash out any cuts or abrasions or to wash the dust out of your mouth after following too closely behind someone up a dusty trail. The whistle will definitely come in handy if you happen to go off over an embankment and need someone to find you. A whistle is much louder than a scream and is more likely be heard over the sound of the motors of passing ATVs. The radio can come in handy to let others know of your location or to call for help in an emergency. You can also use it if you get lost, or maybe to have your mate bring you an extra soda on their way up to where you are. Don’t skimp on safety gear, either. Always wear, at least, a Snell- or DOT-approved helmet and eye protection. I also recommend gloves, ankle high boots, long sleeves, and pants. You never know when a briar across a trail either will suddenly rip through your skin or get brushed out of the way by the denim of your jeans or better still, your riding pants. The choice is yours. Always check your equipment thoroughly before you take off. Be sure to check the tire pressure. They should all be inflated to the same pressure. If the pressure is different in tires opposite each other, it will make the ATV very difficult to handle even in the best of situations. The appropriate tire pressure is usually between 2 and 6 psi. Check your owner’s manual for the appropriate psi for your ATV. (There is usually a sticker on the ATV with this information as well.) In addition, check the tires for cuts or gouges that could lead to leakage or a blow out. Make sure the brakes are fully functioning as well as the lights, kill switch, ignition, and throttle. Don’t forget to check the fluids like gas and oil for evidence of any possible leaks. When camping on the trail, make sure to take everything you will need with you. Nothing is worse than waking up to horrible morning breath miles from the nearest store and instead of being excited about the day’s ride, all you can think about it is how you would trade those new hand warmers for one dental travel pack! Always pay attention to personal and equipment safety as well. ATVs are high on the list of ‘most often stolen items,’ as they are regularly sold again and again throughout their life without license, titles, bill of sale, certificate of ownership, etc., which makes them very hard to trace. In addition, being in the minority as a woman rider, you do stand out on the trail, so take extra precautions with your personal safety. Be aware of your surroundings and again, the buddy system is recommended on all rides. Here are a few other quick tips for everyone: Be familiar with your ATV and look at the owner’s manual if you have any questions. Never ride beyond your ability! Do not ride double unless your ATV is built specifically for double riders. Doing so makes the ATV less maneuverable, harder to handle, and more likely to turn over or flip. 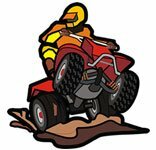 Riding on hard surfaces actually makes it harder to turn an ATV. Do not ride on hardtop unless you have tires specifically for that type of surface. Ride legally and always leave the area better than you found it. Keep the noise levels down by making sure your muffler system meets the 96 decibel limit that was established in 2003. Alcohol and drugs do NOT mix with ATVs. Be courteous to other riders. When on a trail, always show respect to the environment and other riders. Never lend your ATV to unskilled riders. Know and respect the laws about letting children under the age of 16 ride an ATV. Never put your foot down when riding an ATV as a cast will definitely put a damper on going dancing next Saturday night! Lean forward when going up a hill. Go slow going up a hill, but try not to have to stop or change gears, as either one of these actions can cause the ATV to flip backwards. Never back down the hill. Turn the quad around and go back down the hill forward. Be sure to lean back as you are going down the hill. Aways try to keep the center of gravity as low as possible by keeping all the weight you can on your feet. You can usually accomplish this by standing up. Remember to keep your knees flexible to avoid possible injury or strain. Do not pull back on the handle bars when going up a hill. Never use the front brake when going forward at excessive speeds or down a steep slope. These are only a few of the tips you should heed when heading out on the trail, but they are a good start. There will be other things you discover along the way. One final note: Don’t let this article discourage you from riding. It is meant to install enough fear to make you a bit more cautious and safe enough to ride for years to come. I hope to meet some of you out on the trail, always with the rubber side down! Have an awesome ride! If she is getting dressed, this is half an hour ... . This is the least used of all words in the female vocabulary. If a woman is thanking you. Do not question it, just say you're welcome and back out of the room very slowly.